Life was not easy for Ashok before he came here. Nothing is known about his parents, and Ashok and his little brother Satish were wandering around the streets. We were notified about this and gave them shelter. At first it was a bit strange for the brothers and they were somewhat withdrawn, but now they have made many friends and are becoming more and more open. 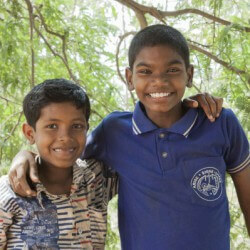 Antony (12 years) is one of Ashok’s new friends. He came to live with us only six months ago. In the beginning he was very shy and kept in the background just like Ashok. He is very modest and always listens well. When you get to know Antony a little better, you will notice that he can be very talkative and cheerful too. He loves playing games, so when the playroom opens, Antony is first in line to go inside. He is the very best at memory.